Math Is More Fun When You Can Hit People With It | OhGizmo! Everything, everything is better if, in addition to whatever its primary purpose is, it can also be used to a.) hit people and b.) take naps. 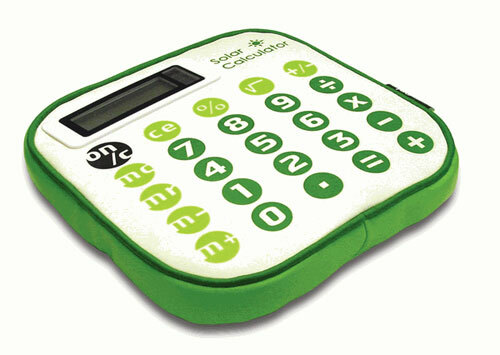 This calculator may do fancy stuff with numbers (also known as witchcraft), but most importantly, it’s soft and squishy. And being solar powered, it’s Earth friendly, too! Yaaayyy! Someone really needs to hack this thing with an accelerometer so that you can throw it at people and have it actually do stuff. Like, gentle toss is add, spinning toss is subtract, and severe beatdown is multiply. Let’s get multiplyin’! The Solar Plush Calculator is $20 from a website called Silly Dilly Tot Spot, which also happens to be a kid’s TV show on the BBC. How cute! I love the color too. I'd get one for my kids (when I have them).